That’s it! I’ve done it today! I’ve finished my minimum of models needed to play Wolsung with my Ash & Oak faction!. Two heroes and four henchmen. They are ready for my tutorial game I’m going to have this Friday. 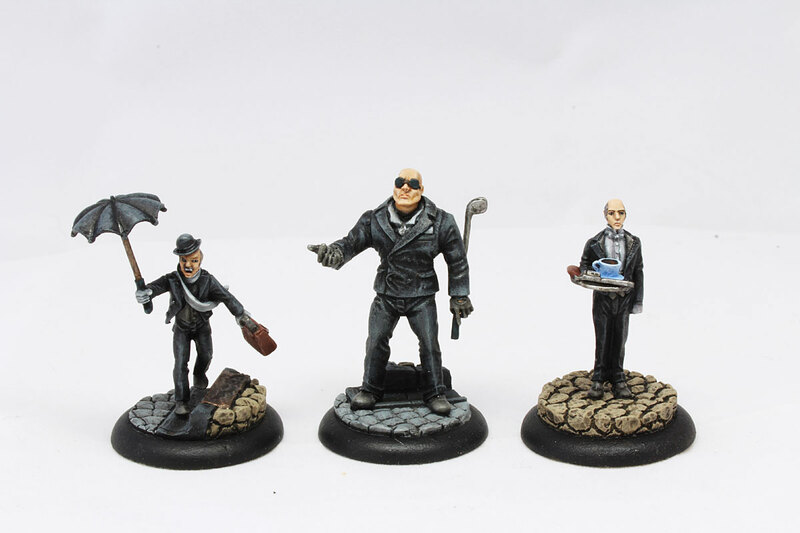 Bruiser and two butlers finished yesterday. I received my printed hardback copy of Wolsung rules last week and finally I had some chance to study them carefully. Even though they are available for free to download, I prefer to have printed release to read – it’s easier for me to sit right back with the book in my hands, and totally focus on the content. And what I was able to read so far – the rules are really simple to make a quick start. Simple, but not naive – options and special rules for factions give the player lots of different alternatives ways to go on with the game. It’s possible to try several approaches – close combat, or shooting brigade. Or maybe try some magic. I really can’t wait to play Wolsung and see by myslef. Really! 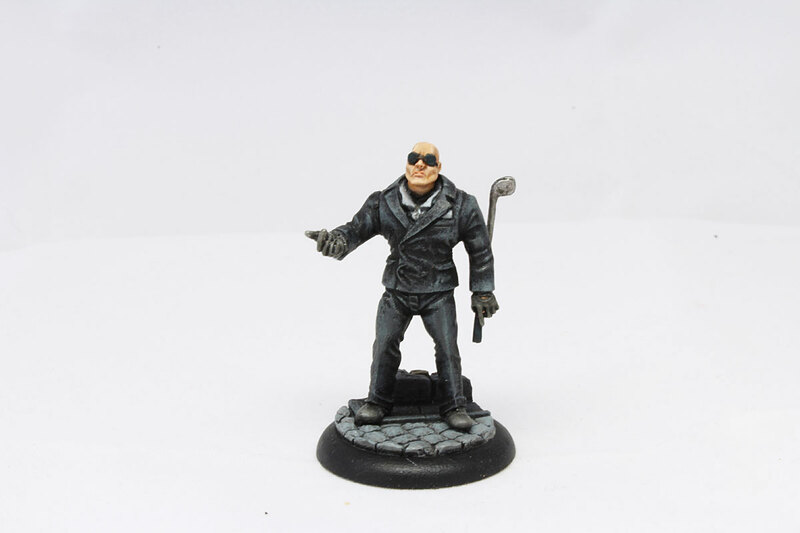 And for start you don’t need much – that’s the beauty of skirmish games. 5-6 models and that’s it. From that point you can easily expand and add more models to your collection. You can play larger games for about 10 or even more models or still play on smaller scale, but with more options to choose from. Quite a difference from Warhammer Fantasy or even Warhammer 40k. Cheaper to collect, faster to paint, and still loads of fun. I don’t have any strategy in my mind for my Wolsung Faction. I started to collect these, because I really like miniatures. I’ll see during gameplay, what options and special rules I’ll be able to use. I also have few miniatures from other Wolsung’s faction – Triad of Lotus Dragon. These are awesome too – kung fu, ninjas and black magic! And really cool models! Bad guys in the city of Lyonesse – adversaries for Ash and Oak. Eventually I’ll paint them too and I’ll have two playable factions. …but first – Ash and Oak. Bruiser and two butlers. I decided to paint them all together in similar colour scheme. Black suits with white and greys add-ons. Butlers on the other hand are quite opposite. Small, fragile men. My first impression when I look at them – why someone even thought about sending them on the streets? They don’t look like fighting material. First butler – with the plate (there’s a cup of coffee and a gun on it – so maybe he can be useful in the shoot out:), skinny, around his 60s looks calm. Typical English butler – love the contrast here. Peace in his posture and in his eyes – he is so unlike the bruiser. House help – that’s what he is, but apparently also useful in the fight. 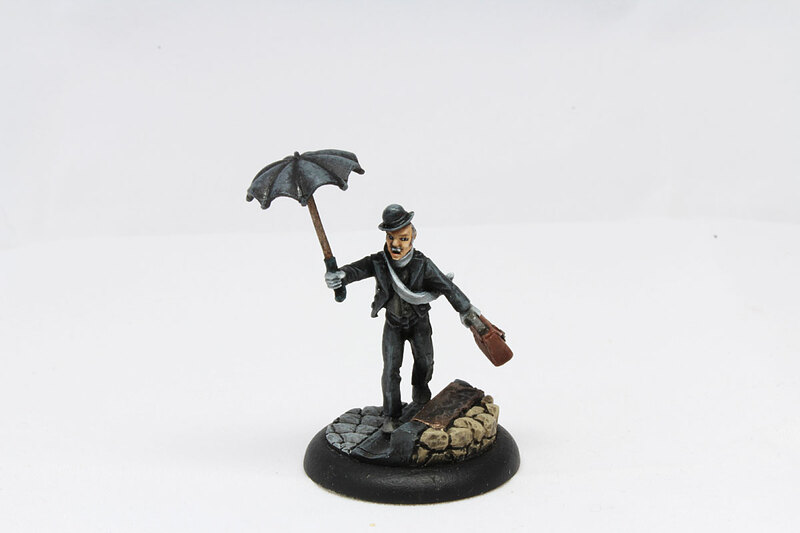 Second butler – with umbrella and suitcase. He looks like a messenger or kind of secretary (with all important papers in the briefcase). One more time – no way he could fight, but we’ll see about that. Never judge them based on their body type:). Butler with umbrella and suitcase. The most important thing is butlers have the ability to warn about incoming danger (bullet in most cases) any noble men and women from Ash and Oak near by. If they decide to to that- they received wounds instead their masters. That’s what I call true devotion. Soon I will see – how I can use the rule in action. 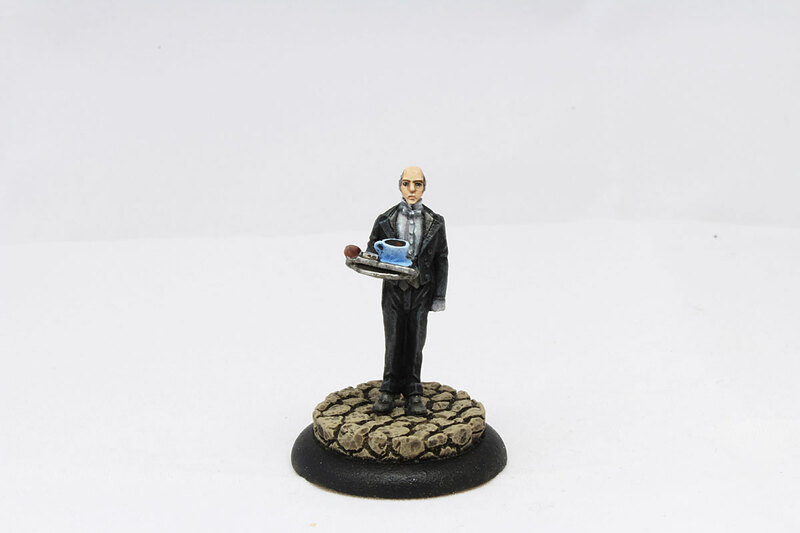 Bases are Cobblestone round resin bases from Micro Art Studio. Plans for future: few more Skaven to finish (I know! I’ve written these words quite a few times, but the vermin seems to be neverending story! There are so many of them!) – 2 Jezzail Team and Doomwheel. I hope to use them in my next WHFB battle. And after that – I’m going to start already assembled Blood Angels Terminators Squad. That will be something different and refreshing. …but first – today later afternoon I’m going to Gdańsk (north of Poland) for few days, to spend nice time with my wife, and of course to meet representatives of some local gaming community. And play Wolsung for the very first time! Yay! Expect full report from the battle. Until next time! Good looking gang – can’t wait to hear your view on the game!